with my DSLR camera? You might be surprised to hear the answer. Do you want to create beautiful, lasting memories of family functions, sporting events and other meaningful events in your family’s life? Simply knowing the tools at your disposal will help you take high-quality photos with that DSLR you’re keeping on auto. Here are 3 settings you need to know to take better photos. Try turning your camera to aperture priority mode (A). This will allow you to test different f-stop settings without having to worry about anything else. With the camera on aperture priority mode, the other settings on the camera will auto-adjust. Give it a try and let us know how it goes in the comments! 2) What is shutter speed? Shutter speed is the speed at which the shutter passes in front of the image sensor, thus determining how long the image sensor is exposed to light, measured in fractions of a second. A slow shutter speed lets in more light and allows for more motion blur. Sometimes this can have a cool effect like in the photo below. But, if you’d prefer to have a less blurred image, try using a faster shutter speed. For more tips, visit the B.Britnell Blog. Turn your camera to shutter speed priority (S). Experiment with photographing moving objects. What happens when you change the speed? ISO is a digital setting that uses the camera’s software to boost the light in the image. And while lots of light is good, it’s important to use a high ISO sparingly, as it can cause the image to look grainy. Read more and check out other educational images at ExposureGuide.com! Turn your camera to manual (or M). Experiment with all 3 of these settings at once and let us know what you came up with in the comments! Looking to further your skills? in our Adult DSLR Photography class beginning October 14th! Let’s face it — kids can take a Scratch Programming class in many different places throughout Westchester County, or do the Hour of Code from home. There are a million and one ways to learn about 3D printing, computer programming or animation. You get the picture… And so do we. But there’s the thing: experience. Meaningful learning is all about the experience. Knowledge retention happens when a person can put emotion behind the skills they learn. At the DAE, students drive. They get their hands on the tech. They try to go too fast and run into problems. We teach our kids about failure and how not to panic when something goes wrong — about how glitches are good because they teach us what we need to fix. We encourage thoughtfulness and problem solving, discussion and thinking outside the box. Our world is so fast. It’s easy to throw information at people (especially kids) and expect them to get it. (Those kids with their iPads just know how to do all the things!) Classes at the DAE are different. They’re inclusive. They’re project-based. And they’re fun! We invite you to visit us and find out why. Winter classes begin this weekend! January 21, 2017. Learn how to Create a Website, how to use WordPress and How to connect a Website to a Domain: Web Design Classes for Adults in Westchester. Adult School in Westchester: The DAE in White Plains offers adult education classes on how to create a website, how to connect a website to a domain and how to use WordPress. Learn layouts, formatting and just enough HTML/CSS to maintain your site properly and update it accordingly. Classes are enrolling now. Learn more & register: TheDAE.com/AdultClasses or call 914-644-8100. STEM/STEAM (Science Technology Engineering (Arts &) Math) Education isn’t just for kids in White Plains, Scarsdale, Valhalla, Larchmont and surrounding communities, but for adults as well. Watch DAE Founder & President Rob Kissner talk about our new DSLR Photography, Video Editing, Creating a Website, 3D Printing and Programming classes for adults. A tight-knit community. We are all lifelong learners. An escape. Life is crazy. Tech is fun. Enthusiasts, leaders and innovators. We enjoy working with technology and get excited to share our knowledge with family and friends. Role models for our kids. Because if we don’t adapt & grow with tech, how can we expect them to? An experience. Things come and go but experiences last a lifetime. Small, hands-on tech classes with a max of 6 kids per group. Each student gets their own computer to work on for the duration of the program and leaves with a completed project in their newly developed skill. We offer both moring & afternoon sessions for school breaks OR kids have the option to choose both and create a full day out of it! To learn more about The DAE, visit our website at www.TheDAE.com or give us a call at (914) 644-8100. Enroll now for our February Break Programs (Feb. 17th – 21st) – Space is limited! 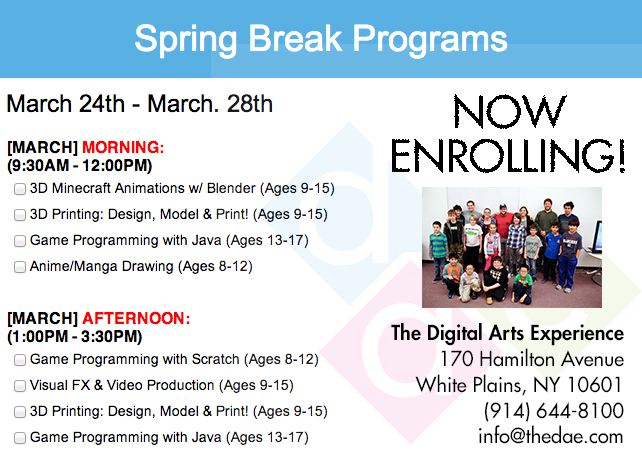 This February Break, The Digital Arts Experience will be providing full or half-day long programs for kids and teens in Westchester, Fairfield and Rockland counties! Programs begin on Monday, Feb. 17th and run through Friday, Feb. 21st. Morning session is from 9:30AM – 12:00PM and Afternoon is 1:00PM – 3:30PM. Students will get the opportunity to work hands-on in our small classes: each individual gets their own computer, DAE 8GB flash drive to save their work on, and focus on their own project throughout the week. It’s not too late to register! Check out our application form with detailed class times and descriptions.